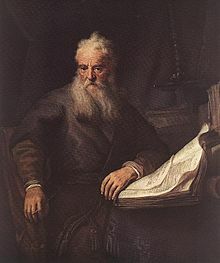 Allegorical interpretation is an interpretive method which assumes that the Bible has various levels of meaning, and tends to focus on the spiritual sense as opposed to the literal sense. Augustine, Confessions, A. Outler, trans. (Dover: 2002), Book 5, Chapter 14, p. 81. As we are clearly aware that the Savior teaches His people nothing in a merely human way, but everything by a divine and mystical wisdom, we must not understand His words literally [σαρκίνως] but with due inquiry and intelligence we must search out and master their hidden meaning. Clement of Alexandria, The Rich Man's Salvation, Loeb Classical Library Volume 92, p. 281. George Stanley Faber, Christ's Discourse at Capernaum: Fatal to the Doctrine of Transubstantiation (1840), pp. 144-147. There is nothing unreasonable in our seriously studying all possible means of tracking down the benefit to be had from the divinely inspired scripture. If indeed the literal meaning, understood as it is spoken, should offer some benefit, we will have readily at hand what we need to make the object of our attention. But if something that is said in a hidden fashion, with certain allegories and enigmas, should yield nothing of benefit according to the readily apparent sense, we will turn such words as these over and over in our mind. ... When it comes to the insightful reading of such passages that comes via the elevated sense, we shall not beg to differ at all about its name—whether one wishes to call it tropologia, allegoria, or anything else—but only about whether it contains meanings that are beneficial. Gregory of Nyssa, Commentary on the Song of Songs, as translated by Margaret M. Mitchell in Paul, the Corinthians and the Birth of Christian Hermeneutics (2010), p. 1. Listen then to what the parable of the sower means: When anyone hears the message about the kingdom and does not understand it, the evil one comes and snatches away what was sown in their heart. This is the seed sown along the path. The seed falling on rocky ground refers to someone who hears the word and at once receives it with joy. But since they have no root, they last only a short time. When trouble or persecution comes because of the word, they quickly fall away. The seed falling among the thorns refers to someone who hears the word, but the worries of this life and the deceitfulness of wealth choke the word, making it unfruitful. But the seed falling on good soil refers to someone who hears the word and understands it. 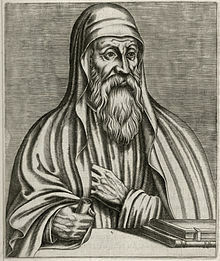 Origen of Alexandria, “How divine scripture should be interpreted,” On First Principles, book 4, chapter 2, § 2, Readings in World Christian History (2013), p. 69. Origen of Alexandria, On First Principles, in Readings in World Christian History (2013), p. 70. Origen of Alexandria, On First Principles, in Readings in World Christian History (2013), p. 75. Paul of Tarsus, Epistle to the Galatians 4:22-24 ESV. In the paradise, made by God, all the plants were endowed in the souls and reason, producing for their fruit the different virtues, and, moreover, imperishable wisdom and prudence. ... These statements appear to me to be dictated by a philosophy which is symbolical rather than strictly accurate. For no trees of life or of knowledge have ever at any previous time appeared upon the earth, nor is it likely that any will appear hereafter. But I rather conceive that Moses was speaking in an allegorical spirit, intending by his paradise to intimate the dominant character of the soul, which is full of innumerable opinions as this figurative paradise was of trees. Philo, On the Creation of the World. Spinoza, Theologico-Political Treatise (1677), 6:98. Above all, words must be recognized as symbolic pointers to truth, not objective containers of truth. John Shelby Spong, Resurrection: Myth or Reality? (1994), p. 37. Andrew Dickson White, A History of the Warfare of Science with Theology in Christendom (1896) Vol.1 p. 54.